The Generals’ War: Operational Level Command on the Western Front in 1918. David T. Ząbecki. Bloomington, Indiana: Indiana University Press, 2018. Over the past several decades, Major General (ret) David Ząbecki has made a reputation for himself as one of the premier historians of the German side of the First World War. In The General’s War, his most recent work, he examines the role of the leading generals on the Western Front, generals who determined the outcome of that most terrible of all wars in the battles that lasted from March through November of 1918. What Ząbecki has produced is a masterful study of leadership at the top: good, bad and indifferent. The crucial military leaders on the German side were Field Marshal Paul von Hindenburg and General Erich Ludendorff; on the Allied side Marshal Ferdinand Foch, Marshal Philippe Pétain, Field Marshal Douglas Haig, and General of the Armies John J. Pershing were key. The General’s War is, thus, a comprehensive look at generalship at both sides of the line. Moreover, Zabecki provides a judicious judgement of those leaders, based not only on his solid historical leadership, but also on his years serving as a senior officer in the American military. And that is precisely what Ludendorff proceeded to do. MICHAEL achieved an astonishing tactical success, punching a huge gap in the British Expeditionary Force (BEF), but without any clear operational goal the Germans even missed the chance to disrupt the logistical system by capturing Amiens on which the British depended. In the end, the Germans captured an enormous amount of useless territory—at least by the standards of previous offensives on the Western Front. Ironically, that new salient was going to be more difficult for the Germans to defend than the positions they had left when MICHAEL began. Moreover, Ludendorff’s gamble cost the Germans nearly 240,000 casualties, most of whom were in first-line attack divisions. Allied casualties were only slightly higher, and offset when 329,000 American troops arrived in France that month. Over the next three months, Ludendorff followed up his success with a series of tactical victories that bled the German Army white for neither operational nor strategic purpose. There was no clear operational line connecting the offensives at all. Depending on their success, [the German high command] allowed successful attacks to continue instead of focusing on clear operational objectives. Consequently, Operation MICHAEL and all the follow-on offensives got lost in an eccentric operational void. In the end, the German forces won engagements, but no battles that were decisive for the outcome of the war. One cannot help thinking that the General Staff in the person of Ludendorff focused exclusively on the tactical challenges of trench warfare, while completely forgetting the operational skills. If the Germans had their problems, though, so did the Allies. Churchill once remarked that the only thing worse than having allies was having no allies at all. The MICHAEL offensive came close to literally breaking the British Expeditionary Force and the French Army apart. As MICHAEL bashed General Hubert Gough’s Fifth Army back, and the British fell back toward the northwest to protect the Channel ports essential to their logistical support. At the same time, Pétain and the French Army focused on protecting Paris, and the two Allied armies appeared headed toward separation. At a meeting at Doullens on 26 March, Allied political and military leaders made the crucial decision that was to prevent any break between the British Expeditionary Force and the French Army; they created a unified command, as Ząbecki notes, “of sorts.” Under this new structure, Ferdinand Foch assumed the task of coordinating initially the defensive and then later the offensive operations of Allied armies for the remainder of 1918. The brief to Foch was to coordinate “the actions of the Allied armies on the western front.” That agreement did not provide the French general with much teeth to push the commanders of the various Allied armies to do his bidding, but it was sufficient to provide him with the authority to coordinate the movements of reinforcements to counteract Ludendorff’s great offensives. In the end, Foch provided the stabilizing influence and moral support needed to see the Allies through the dark days of spring 1918. By the time the last German offensive had failed in July 1918, Ludendorff’s offensives had cost his army nearly a million soldiers. Allied casualties were on the same order, but they had substantial reserves, and the Americans were arriving in France at the rate of a quarter of a million men a month. In late 1916, when the Germans made the decision to launch unrestricted submarine war, which they knew would bring the United States into the war, Ludendorff dismissed that possibility as irrelevant. Beginning in July 1918, the Allied counter-offensives kicked off with a series of French offensives under Pétain’s direction. With Foch’s psychological support, Pétain was able to keep his pessimism under control. But the decisive blow that shook Ludendorff to his heart was the British attack by the British Expeditionary Force’s Fourth Army under General Henry Rawlinson on 8 August. A combination of tanks—an entirely new weapons system—and combined arms tactics quite literally broke the defending German divisions in a fashion that had never occurred before on the Western Front. Ludendorff described it as the blackest day for the Germans during the war. In this case, Haig was supportive of Rawlinson without indulging himself in the micro-management that had impacted so negatively on the battles of the British Expeditionary Force during the previous two years. What Zabecki has managed to do in this work is draw these tactical pieces together with the inter-relationship among generals, who at times could prove to be extraordinarily quarrelsome. The British success heralded a series of Allied attacks that kept the Germans off balance while inflicting more casualties on an army that had already been bled white. Ząbecki does a wonderful job in laying out how the various Allied commanders kept the pressure on the Germans right through to the armistice. What makes his account even clearer is a series of first-rate maps, in color, that provide a wonderful backdrop to his account of the great battles and leaders who determined the outcome of the Great War. Ząbecki also combines the contributions, mistakes, and internecine quarrels among senior generals on both sides in a masterful fashion. This is not only a perceptive examination of leadership at the highest levels, but a first-class examination of the relationship—or non-relationship—among the high commands of the opposing armies in understanding and dealing with the strategic, operational, and tactical difficulties the war had raised by 1918. Why should we, in the second decade of the twenty-first century, be reading a book about events that occurred over a century ago? The answer quite simply is that the leadership provided by the opposing generals suggests a great deal about how we should think about military leadership in our time. Above all, Zabecki’s account makes it clear coherent strategy is far more important than brilliant tactics. The almost exclusive focus by the German leadership—and not just Ludendorff—on tactics created a situation where crucial operational goals, such as the main logistics centers of the British Expeditionary Force at Amiens and Hazebrouck were not even considered in the planning and conduct of the MICHAEL offensive. The continual dismissal of strategy by the Germans over the course of the war had simply placed the Reich in a more and more hopeless situation. On the Allied side, the quarrels and arguments reflected the reality of any alliance under the pressure of war. 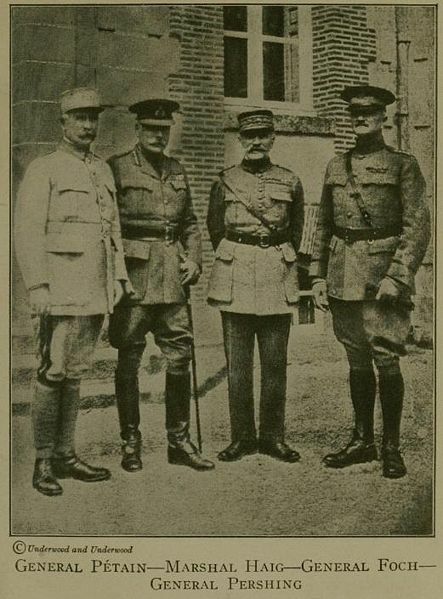 Differences with allies are simply a part of the equation of war, but then the quasi-alliance of France, Britain, and the United States—the Americans were only an associated power—provided sufficient strength to weather the German storm in the spring, and then the superiority to beat the Germans in the field in the late summer and fall of 1918. Military leadership at the operational and strategic levels requires thinking beyond today’s battle, and that was something the Allied military leaders succeeded in doing. As this author and Allan Millett suggested a number of decades ago, if you get the strategy wrong, then no matter how well you do on the tactical level, you lose. Williamson Murray is Professor Emeritus of History at The Ohio State University. 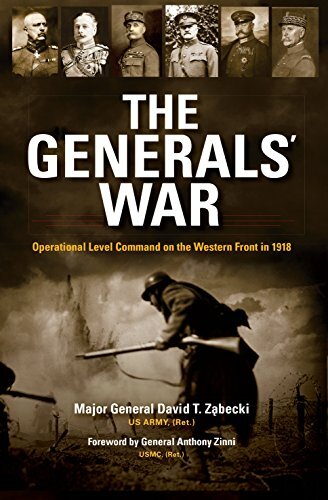 David T. Ząbecki, The Generals’ War, Operational Level Command on the Western Front in 1918, (Bloomington, IN: Indiana University Press, 2018), 72.